I especially enjoy rainy days while volunteering at Longwood Gardens. The pace is noticeably slower and conversations more intimate. The visitors are fewer, and we have time to leisurely discuss the history of the house, the Gardens, and the du Pont family. We talk about the visitors’ hometowns and their relevant experiences. I learn from them as much as they learn from me. During the brief, quiet times when the house is empty of visitors, I rest in Pierre’s personal conservatory and pet Belin the cat, who wisely stays inside. Employees stop by to chat as the pace slows for all of us. Longwood Gardens becomes the peaceful, rejuvenating retreat it was meant to be. Visitors come even in the severest weather. Several chartered buses arrive each day, and those are planned weeks in advance. Local visitors bring their out-of-town guests, and no other time is available. And, finally, we have visitors who just prefer rainy days. We become companions, sharing a common bond as if shipmates on a long ocean voyage. There is never a perfect time to visit Longwood Gardens. There will always be something spectacular that has just finished blooming, or something else that has not yet bloomed. But there will always be much to enjoy at the moment, your moment, with your unique perceptions. Any time becomes the perfect time. 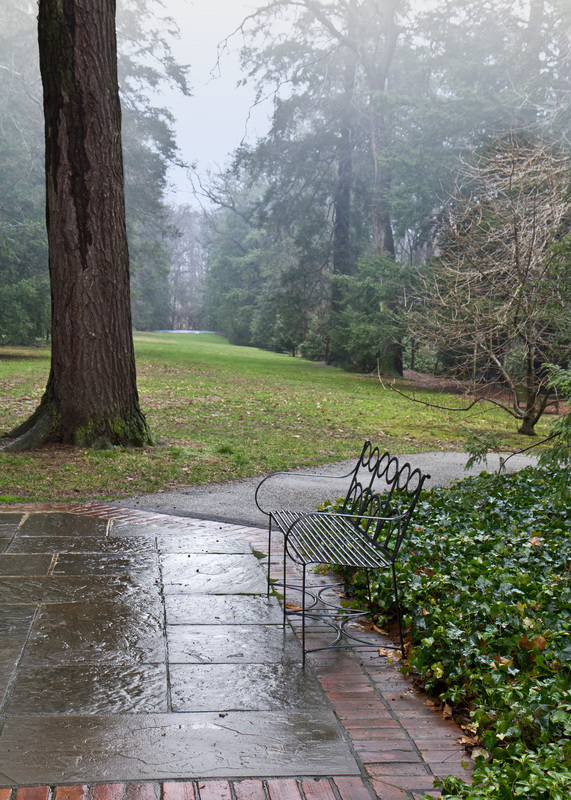 Traces of disappointment fade as they gradually feel privileged to experience a rainy day at Longwood. If the weather is only lightly drizzling, I recommend they walk among the tall trees in the area of the chimes tower, or close by in Peirce’s Woods. Sure, the colorful blooms will be subdued, but seeing the huge, gray trees looming silently out of the mist will be a transcendent experience to long remember and to share with less fortunate friends back home. This entry was posted in Longwood Gardens and tagged Belin the cat, Peirce-du Pont House. Bookmark the permalink. So true, I could not agree more, thanks for putting it in words. Excellent time to take some better pictures.